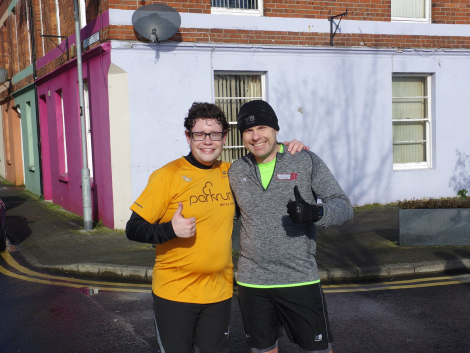 Portstewart, Jordanstown, Shane’s Castle, Glenariffe, Stormont, Ormeau, Bundoran, parkrun + more over the jump! Northern (No) Lights: Paul survived the nighttime route! 1 Andrew McDermott 03:19:25 New PB! Thanks: Andy focusing on the job at hand! Thanks: First place & new pb - all in a day's work! 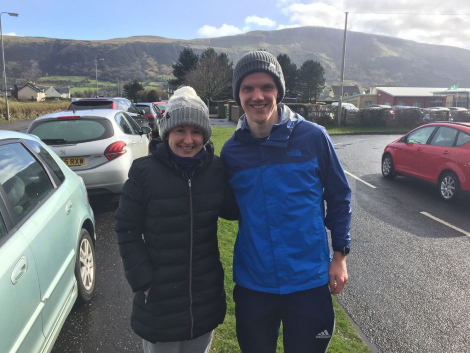 28 Judith McManus 01:46:52 New PB! 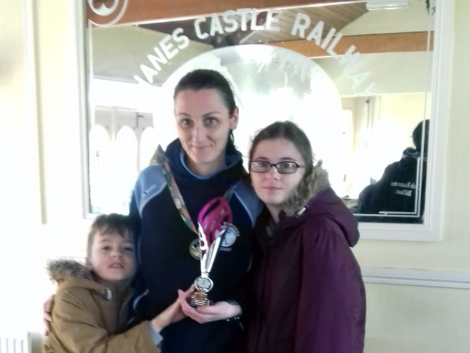 Judith's Castle: Powering her way to a half marathon PB! Judith's Castle: Celebrating with her kids at the finish! Anyone hungry yet with all this talk of potatoes?! This one kicks off in Waterfoot, and for the first two miles makes you think that this might be a walk in the park. Then between mile 2 and r there is a spike in elevation from around 50ft to almost 1,2000ft – within a mile, then back down again, and two mile back to the start. Tired – our duo definitely was! Spud Power: Bernie and Paul ready for the off! Spud Power: Action show of Bernie mid race! Another outstanding angry country outing from one of our favourite Dub stalwarts! 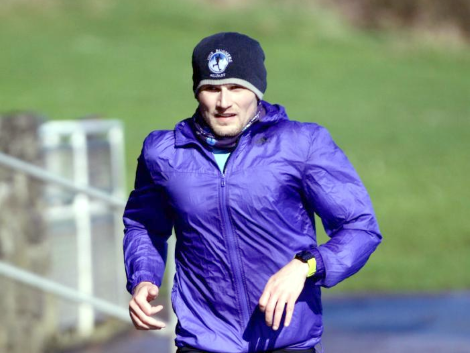 With Friday being a bit of a washout, that left conditions underfoot just perfect for the “ideal” cross country session – slippery wooded areas and ever deepening mud baths – conditions lacking from some of the more recent similar events. Brilliant running Mike – can always trust you to sneak in a wee race somewhere off the radar!! Charity races are always a great event, and one that you can feel good after running and supporting. On Sunday, Addiction NI’s annual race was held in Ormeau Park in lightning, hail and rain storms – so bonus points this year! 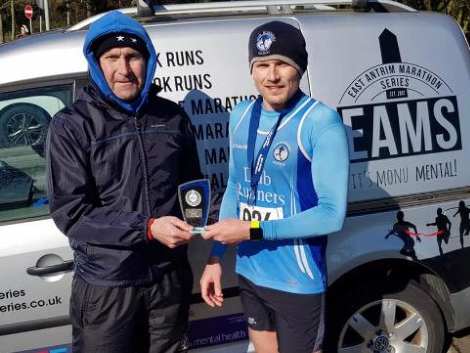 The course should be familiar to most in the club – three laps of Ormeau Park in the cold usually means the Seeley Cup, but in March it’s the Race to Recovery! 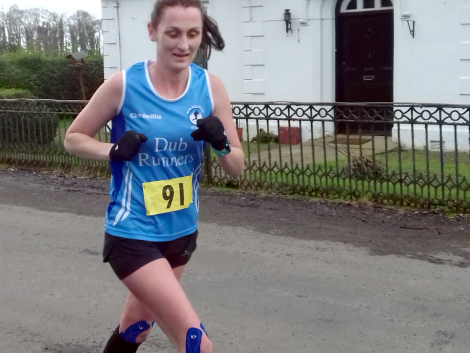 56 Karen Carlisle 00:47:46 New PB! 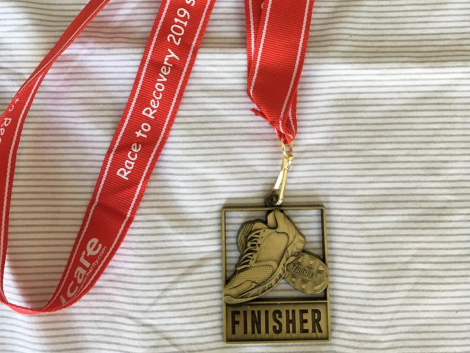 Recovery: Look at that bling! A bitterly cold and very windy morning in Bundoran and not for the faint hearted! Starting at the west end and heading towards Sligo with a merciful headwind. Turning right at the 3 mile mark and towards Toulan with the wind on your back. 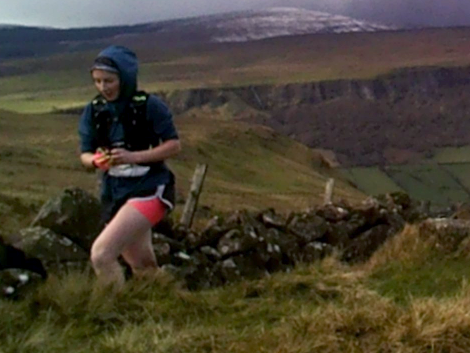 Completing the loop at 5 miles and heading up the bypass towards Ballyshannon. A welcome breeze eased the long laborious climb uphill towards Roogie. Who would do such a run?! Brutal conditions on Sunday Paul, brilliant running admist some gael force winda and some magnificent waves several metres high! Naturally you couldn’t do a race like that without the obligatory stop at Biddys O Barnes on the way home to make it all worthwhile. Have you ever seen someone so happy to have finished a race?! Bun-done: Paul looking happy with himself! 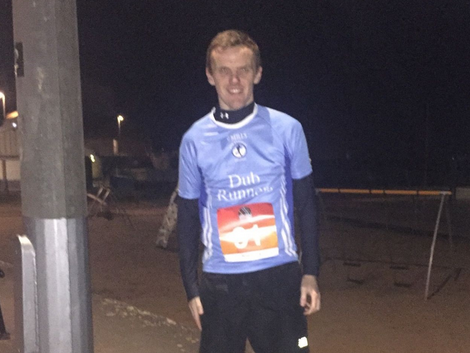 Paul MCFLYNN 00:24:14 Newbie PB! Rob WALKER 00:21:28 New PB! Catherine BAILLIE 00:22:54 1st Place! New PB! Marcella CASSIDY 00:24:18 2nd Place! New PB! James TRAINOR 00:19:15 1st Place! 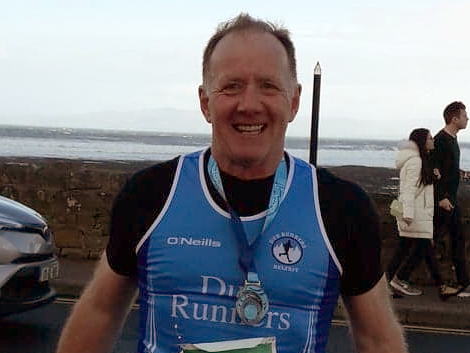 Dermot DAWSON 00:24:54 Newbie PB! parklife: Look who we found in Derry!! Happy 40th Birthday Ivor! A word of thanks to our little spies who sent us race updates over the weekend and kept your fingers on the pulse. This would not be out on time this week without all the help – and after all this is everyone ins club’s roundup – so just right to take ownership of it! More of the same over the coming months! I have a suspicions that the missus is putting glue on my antique weapons collection – she denies it, but I’m sticking to my guns!